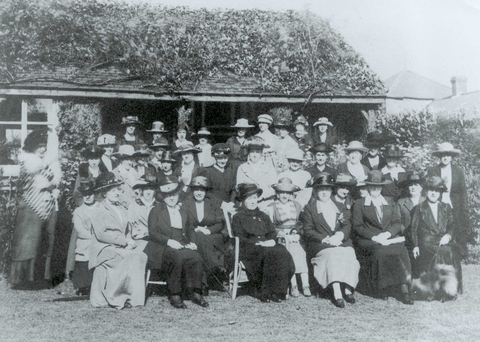 The first WI meeting in the UK was held in Llanfairpwll on Anglesey, Wales, on 16 September 1915. Since then, the organisation has grown to become the largest women's voluntary organisations in the UK with over 212,000 members in over 6,300 WIs.
To see the history of the WI at a glance, click here to see our centenary timeline. For a more indepth look at the history of the WI, click here to view the archive information. If you are an archivist or a researcher, please scroll to the bottom of this page and select "for archivists and researchers" for a range of more indepth articles on the WI. The NFWI and Denman archives are deposited at the Women's Library at the London School of Economics and Political Science (LSE) library, where they form part of a major collection and is accessible to the public. The records of many individual WIs and federations are deposited in their local County Record Offices, where they can also be accessed by the public, though it is usually wise to order them in advance.